Workshop happening December 17, 2017 from 12:30 – 2:30pm. Want to learn how to make your own adorable plush toys? 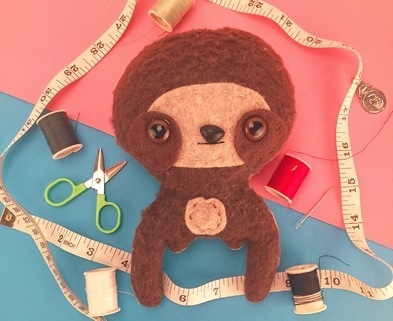 Join us for Mikey Anderson’s Slothie Yarnie Sewing Workshop! Bring a friend or fly solo and meet fun people. Come in empty handed and leave with your very own handmade plush sloth! No sewing experience necessary. Kids and adults welcome! Your entry fee includes all materials needed to make your very own plush Slothie plus instruction by Yarnies creator Mikey Anderson. Mikey creates quirky little characters for the enjoyment of being immersed in his own imaginative world. These characters range from adorable foxes to little hipster dudes who come in the form of plush toys, zines, and key-chains he calls “Yarnies.” They are silly, colorful, and googly-eyed creature that wear plaid shirts and bow ties that are reminiscent of the retro cartoons his generation grew up with.